The new location of Blaze Pizza opens Friday with a free pizza promotion. 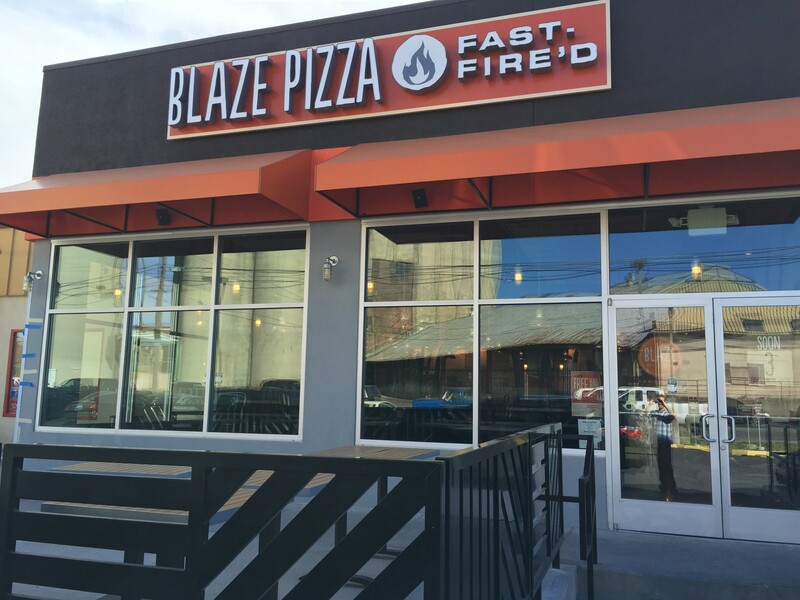 Today the California-based restaurant Blaze Pizza will open its first location in Washington state on 926 North Division Street. Founded by Elise and Rick Wetzel (co-founder of Wetzel's Pretzels), Blaze Pizza features a menu including a variety of signature pizzas, salads, blood orange lemonade and s'more pie. To kick things off, on Friday, Sept. 25 from 10 am to 1 am, Blaze will be offering a free build-your-own pizza to any customer that follows them on Instagram, Twitter or Facebook. Located near Gonzaga University, the restaurant will be accepting Bulldog Bucks, allowing Gonzaga students to swipe their Zag Cards as payment for their meal. Zag Card or not, Blaze Pizza is known for affordable prices, offering pizzas for only $8. The 2,600-square-foot Spokane location has seating for 52 inside, with an outdoor patio as well. Blaze Pizza's new location is constructed of recycled and sustainable materials, uses eco-friendly packaging and features energy-efficient LED lighting. Speaking for Owner Patrick Vollmer (who also owns the Sonic on Division Street), Account Manager Martina Schmidt says that Blaze Pizza is aimed to appeal towards a different audience than your typical pizza joint. "Blaze Pizza is very high energy, and we are looking to appeal to a younger audience. We are faster than your typical pizza restaurant, more casual, and everything is under 8 bucks," said Schmidt. Since the opening of the first Blaze Pizza in Irvine, California, in August of 2012, the chain has grown to 85 locations in 20 different states, including the District of Columbia, and the company is backed by investors such as LeBron James, Maria Shriver and Boston Red Sox co-owner Tom Werner. Blaze's signature pizzas include the "Redvine," featuring red sauce, mozzarella, cherry tomatoes, parmesan, basil and an olive oil drizzle. The "White Top" features white cream sauce and is topped with mozzarella, bacon, garlic, arugula and oregano. If you are balling on a budget, you can get a customized one-topping pizza for $5. So if you need some food on Friday and your wallet is feeling a bit light, head on down to Spokane's newest eatery for a free custom-built artisanal pizza. Simply show that you follow Blaze Pizza on Instagram, Twitter or Facebook, design your pizza and enjoy.